Often use this location for Parcel Point. Staff are always welcoming and aren't bothered to help. Recommend this location. 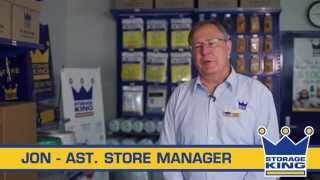 Thank you Storage King, for your generous sponsorship for Angel Gowns Australia. We now have a clean, dry storage space to keep donated wedding dresses and packaged Angel Gowns that are ready for delivery where they are needed. What a fantastic way for you to support the community . We at Angel Gowns Australia appreciate your help more that words can say .Stotage Kings Greenacre you are champions . Thank you Storage King for helping Angel Gowns Australia keep our many donated wedding dresses safe and secure. We specialise in Storage for the Greenacre Bankstown Area. At Storage King Greenacre, we have experienced and friendly staff that are ready to assist you with your storage needs. Our large facility conveniently located off the Hume Hwy at Greenacre, (near Bankstown) is purposely built with small and large units available to accommodate your needs. Storage King Greenacre are proud sponsors of One Meal It Makes a Difference, Angel Gowns Australia and Legacy (Bankstown). Storage King Greenacre proudly services Strathfield South, Chullora, Yagoona, Potts Hill and Bankstown.